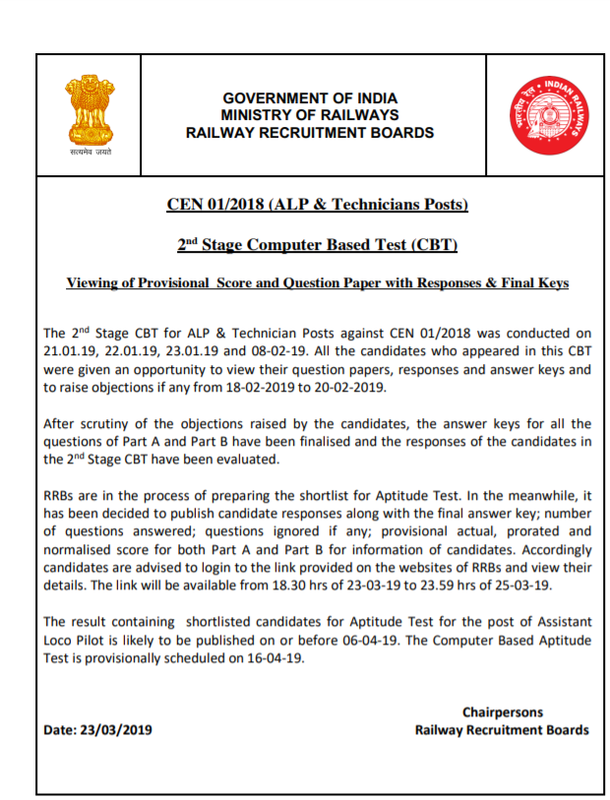 RRB ALP Scorecard : The railway recruitment board (RRB) has released the scorecards for ALP 2nd computer based test (CBT) on its official websites. Provisional Score and Question Paper with Responses & Final Keys (ALP & Technicians Posts) have been uploaded on the RRB Websites. The exam was conducted on January 21, 22, 23 and February 8, 2019. Candidates who appeared in this CBT were given an opportunity to view their question papers, responses and answer keys and to raise objections if any from February 18 to 20. Candidates can view the results only till March 25, 12 midnight as the link will not be available after that. “After scrutiny of the objections raised by the candidates, the answer keys for all the questions of Part A and Part B have been finalised and the responses of the candidates in the 2nd Stage CBT have been evaluated,” the official notice reads. Viewing of Provisional Score and Question Paper with Responses & Final Keys The 2nd Stage CBT for ALP & Technician Posts against CEN 01/2018 was conducted on 21.01.19, 22.01.19, 23.01.19 and 08-02-19. All the candidates who appeared in this CBT were given an opportunity to view their question papers, responses and answer keys and to raise objections if any from 18-02-2019 to 20-02-2019. RRBs are in the process of preparing the shortlist for Aptitude Test. In the meanwhile, it has been decided to publish candidate responses along with the final answer key; number of questions answered; questions ignored if any; provisional actual, prorated and normalised score for both Part A and Part B for information of candidates. Accordingly candidates are advised to login to the link provided on the websites of RRBs and view their details. The link will be available from 18.30 hrs of 23-03-19 to 23.59 hrs of 25-03-19. The result containing shortlisted candidates for Aptitude Test for the post of Assistant Loco Pilot is likely to be published on or before 06-04-19. The Computer Based Aptitude Test is provisionally scheduled on 16-04-19.